Happy Wednesday! I hope that you are all having a great week so far. It’s a short work week for me as I’m flying down to San Antonio on Friday, so I’ve been super busy. How come the shorter weeks always feel like the longest?! Today I thought that I would share with you my favorite races in Connecticut. I know that Connecticut isn’t exactly a vacation destination state, but if you’re looking to run a race in every state you eventually have to come here 🙂 While I definitely haven’t run every race in Connecticut, the list below is based on personal experience and feedback from my running friends. This fall race takes place in Hartford, CT and has something for everyone! There’s a kids race, 5K, half marathon, marathon and marathon relay. For the longer races you run through neighborhoods in Hartford and West Hartford. The elevation chart isn’t too bad for this race (peaks below 200 feet) and it’s touted as a BQ qualifier. I haven’t run this race (hopefully in 2020) but I have numerous friends that have done the half marathon and marathon and they have nothing but positive things to say about the race. For an added bonus, October in Connecticut is usually pretty decent weather wise. this race also takes place in October in Norwalk, CT. you get a little bit of everything on the course – running downtown by building, scenic views and running through neighborhoods. The course has a generous time limit and the race organizers wait until every last person crosses that finish line! I’ve done the half marathon twice (recaps here and here). Although my experience this year wasn’t great due to stomach issues, I would still totally recommend the race. It’s a little challenging with some hills and inclines but the post race party makes up for that because it has tons of food and drinks, including pizza and beer. This race takes place in early June in Fairfield, CT. It’s not the easiest course but it’s also not super challenging either. I think the best part about this race is the crowd support and the fact that you get to run through really pretty neighborhoods. The post race party is great because it’s on the beach. It’s a really happy/chill vibe and a good amount of food to pick from. I’ve done this race a few times (recaps here and here) so I probably will not run it again, but it can be a great race if it’s not too hot! This race takes place in September in Milford, CT. I’ve only done this race once but I clearly remember all the amazing views of the water that we enjoyed on the out and back course. Also it’s pancake flat so great for a PR! Have you run any races in Connecticut? If so, which ones are your favorite? Last but not least, I’m linking up with Lora from Crazy Running Girl, Marc from Train With Marc and Debbie from Coach Debbie Runs for Coaches’ Corner! I haven’t ever run in Connecticut I can’t even say I’ve been there…I need to get out more. But I’ll agree that this week has felt extremely long. It’s not exactly a destination spot for races, lol, but I still wanted to offer some options. 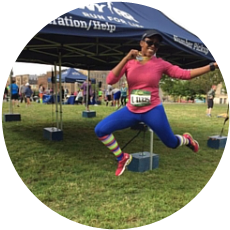 I have never been to CT, and I do have the goal of running a race in every state…so, these all sound fun! I’m totally in love with that pirate/skull medal! I have not run in CT and it’s not far from NY. I have a friend in Torrington. Have you run the hogs back half? Yes I’ve heard of that one too. Two of my friends did the race last year and liked it. I actually haven’t heard of any of these races! Connecticut isn’t that hard to get to so I will need to keep these in mind once I start racing again! That sounds great Lisa! Let me know if you ever decide to do a race here – I’d love to meet up! I have NOT run any races in CT…but I had to DNS a race in CT and I’m still bummed about it! There is a winter, indoor marathon at the XL center (I think that’s what it’s called) in Hartford. I was so excited for that race, but we woke up race morning to a blizzard. I lived about 1.5 hours away in Vermont at the time, and we couldn’t get there. womp womp. Oh I’ve heard of that race in Hartford! So sorry that you weren’t able to run it but maybe you’ll be able to do it another year. If you do, let me know! A race by the water is always good. Although the ones I’ve done by the ocean have either been unseasonably hot or cold, so there’s that. Of course I’m one & done, but the half I did in CT, which is super hilly, was Redding Road Race. I’d still really recommend it! For a small race really well organized. Down to an early start for slower runners — you don’t see that every day! Same for me! Any race I’ve done by the water tends to be super hot lol. I’ve heard that the Redding race is super hilly! Redding was hilly, but I actually don’t think it was my hilliest race. It was also really hot . . . but still so well organized & a nice course — I even PR’d it. It was several years ago, but I’d recommend it. Great list! I am hoping to run a race in every state, so this will be great for when I get around to Connecticut! We will be in New England this summer, and I am hoping to get in two states while there. Fingers crossed it works! These all sound like fun races! I’m not too far away from Connecticut, so I will have to check these out!! If you decide to check out CT for a race, please let me know! I have never run in Connecticut. The Hartford Marathon has always sounded like a good one to do especially being a Boston Qualifier and relatively flat! I’ve heard nothing but good things about the Hartford Marathon! Yes I would totally race with you in CT and it’s not too far from NYC.